Thank you so, so very much for all your dedication to our ceremony. 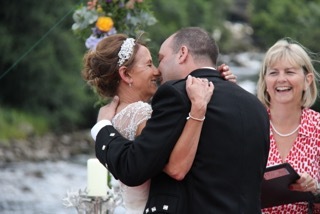 It has been an absolute pleasure creating the happiest day of our lives together and with you. what can we say…..you were absolutely amazing and we cannot thank you enough for making the most memorable day of our life what it was. We have attached a photograph which we think speaks a million words. My family thought you had a very natural ability of putting people at ease and made the whole ceremony exceptionally personal to both Gary and I – which I’m sure is part of your job – but you seemed to surpass this. We cannot thank you enough for everything you have done for us. We thank you so much for the wonderfully warm, and personal ceremony which you conducted for Becca and Rowan on Saturday. We found it very moving and perfectly pitched. We know that Becca and Rowan found it perfect too, and many of the guests also commented in the same vein. Your good natured calm and hanky were very welcome too!! Very best wishes and thank you again. We can’t imagine a more perfect ceremony!